Finally finished her!!! I know, the wing isn't perfect, but I'll practice some more and do another one of her in the future. I love this character WAY too much to only do one image! Thank you for your patience! The long script below is something of a quick glimpse at Gyosei's story with as few spoilers as I could manage. I was hoping to give you a good idea of her personality and maybe got a little carried away... ah well. Thanks for looking and, if you do, thanks for reading! Vic out! Dierdre is the first child of Niamh and Fiacre, older sister of Keary (link below). Dierdre is a strong, independent, and yet usually quiet griffiness. She can often come across as rather cold, but does truly care deeply for those who grow close to her. In her early years, she lives in the seaside cliffs of her northern, Celtic homeland, hunting, fishing, and training with her parents to learn to survive. Like all of her exceedingly rare species, she bears a thick ruff around the back of her head and a broad, heavy build, which she learns to use to her advantage. At an early age, Dierdre displays great skill in hunting, and soon learns which prey to pick based on season, population, and what is best for the various communities of animals. This later comes into play when she learns war strategy. She is able to pick out leaders and other important members of any community, often isolating them to cripple her opponents. Her incredible intuition makes her appear almost psychic and keeps a certain enigma about her, which she uses to her advantage, managing to stay aloof from her own kind to keep most anyone from having any sort of control over her. The story starts when Dierdre is ten years old and her sister, Keary, is born. In celebration of this new life, Dierdre hunts down and brings home a young ram. Curiously, she explains to her mother how she killed the creature, not in pride, but almost as if she needs to justify herself, explaining that it was a quick and relatively painless death. Soon after, her sister comes into the world. In an adorable sequence, the rather confused Dierdre attempts to teach Keary basic things, the first of which is how to eat. It is during this time that she dubs her newborn sister "Ms. Eep", due to the repeated squeaks of the the young griffiness. It's a name that Keary will never live down, much to her later annoyance. Soon after reaching age 15, one of Dierdre's stranger abilities surfaces. She is able to "read" storms and the stars to find messages from their deity, the White Goddess. Similar to a priestess, Dierdre will read these signs and do her best to interpret them. Most often, the Goddess only "speaks" to her when great change is coming. It is also at this age when Dierdre learns to see spirits, namely those of the creatures around her. Though most Celts can see and communicate with spirits due to their deep cultural connection to them, most have to put themselves in a neutral state that is only attained through deep meditation or sleep in order to do so. Dierdre has the rare ability to see both the physical and spiritual realm at the same time, if she so chooses, with minimal effort, enabling her to learn the core nature of each creature she meets based on the form and color of their soul. It is this as well as her keen intuition that makes up her ability: Perception, the ability to observe or sometimes see through what others cannot (she can even ignore powerful illusions, a skill that saves her life more than once) and understand the subtler pieces of a situation. She does eventually learn that spirits can also be used offensively, creating an aura (Gyosei often uses an aggressive aura, making her target wish to run from her. She enjoys doing it to more skittish animals, such as the horses of human knights she finds annoying, making them bolt from beneath their masters) or causing deep injuries that are often difficult to cure, as no physical harm is done to the opponent. An opponent that is not well-connected to their spirit may not notice the injury until the "creature within" is almost dead, affecting their energy and personality. It is said that to live without one's soul is a fate worse than death. At age 20, Dierdre meets members of the Legere (Old Latin meaning "Legion"), a central government/society of griffins of the territories to the south of her homeland. She develops an immediate distaste for them that stays with her forever and makes her somewhat troublesome to the Legere's Elders or leaders. Because their parents died for the Legere (they were later reborn), the supposed "debt" that was owed by most griffins to the Legere does not apply to the two sisters. They are among few who are able to choose whether or not to join, though the Elders try to make it sound otherwise. It is during the Legere's visit that Dierdre and Keary first meet Kasai and Tatsu, a pair of warriors who are the sole members of a fledgling Pride (a small community group/combat unit). 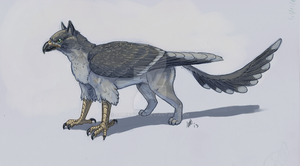 Kasai, a young, oddly colored Osprey griffin, tries to make friends with the harsh griffiness while accompanying her on a hunting trip. She responds rather strangely, at first saying very little, then later, when Kasai is about ready to give up, teaches him how to use his lean build and a few strange bodily features to better provide food. Being an Osprey, he is made more for fishing and even has a pair of oil glands that, when groomed over properly, provide him with a waterproof layer. After having spent some time with Kasai and the large and tough, but kindhearted Tatsu, Dierdre and Keary agree to join the Legere, but not until the harsher cold season is over. Though the Elders argue, the stubborn Celts are immovable, so they concede. It is not the last argument with Deirdre that the Elders will lose. Only a few days before the siblings' departure, the newly named Gyosei (meaning "morning star") receives three prophecies from the White Goddess: The Prophesy of the Blue Dawn, the Prophesy of the Morning Star, and the Prophesy of the Blazing Sun. These three prophesies will, as it is later found, profoundly affect Gyosei's life. Gyosei and her sister (now named Misokazuki referring to the second new moon in a month), then set out to join the Legere. Upon arrival, Gyosei insists that she and her sister will only join a Pride if Kasai leads it. The Elders had no intention of allowing Kasai to lead the Pride, but Gyosei threatens to take her sister and leave if they do not change their minds. For the second time, Gyosei gets her way, something that the ornery Elders are very displeased about. They later add a great deal of trouble to the griffiness's already difficult life in retaliation. The many other members of the Legere often harass and even attempt to steal the stubborn griffiness's younger sister, desiring her incredible healing abilities in their own Prides. Their annoying and sometimes aggressive persistence awakens Gyosei's protective nature and eerily threatening behaviors. It is during this time of trial that Gyosei starts up a habit that will later define her and make her both feared and targeted. She finds high, hidden vantage points from which to observe a situation. Should her aid be needed, she will leap down and remove or threaten a key member of the group that is creating the disturbance. More often than not, however, Kasai is the one to settle disputes, usually concluding by leading his Pride away from the scene. 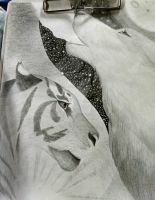 When he feels it is necessary to intimidate the offending group, he will call Gyosei from her hiding spot as a reminder of why the Pride should be left alone. Despite these aggressive behaviors, Gyosei actually tries to avoid combat when she can, particularly with groups. This is mostly because she has rarely ever had to fight with more than one opponent, having developed most of her skills from hunting, and prefers to take down only one target at a time through stealth and wit rather than brute force. Unfortunately, her temper does occasionally cause her to wind up in problematic situations, most of which do not end well for her and usually require the intervention of one of her other Pridemates to get her out. She does eventually learn to use her skills well, mostly because of Tatsu's influence, but is still wary of situations with more than one opponent. Tatsu and Gyosei become among the closest friends in the Pride aside from Gyosei and Miso. Tatsu's strength, both in body and mind, provides a backbone for the Pride and helps Gyosei be her usual self again even in hard times. Tatsu is also wise enough to use Gyosei's ability to its full potential to find both friend and foe. In the end, this leads to the creation of a very unique and well-adjusted Pride. Gyosei's spirit is both beautiful and dangerous. Befitting of her birth name (Dierdre, meaning "sorrowful wanderer"), Bansealgaire is what is called a "wandering spirit", able to separate from her physical body to affect things elsewhere. She can create an aura to summon or drive off other creatures, and is known to lash out at them even if they are not necessarily close to Gyosei. It is because of this that Gyosei does her best to keep her rather dangerous wandering spirit inside her physical form, though she will release the aggressive feline as a last resort. If needed, Bansealgaire will attack another soul, potentially wounding or even killing it. Mostly, the cat merely creates a threatening aura, snarling at other spirits to keep them at bay, giving their bearers a deep and unwavering fear. She may do this to protect Gyosei herself, or, more commonly, someone she cares about. 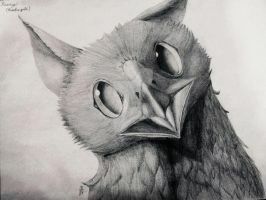 Bansealgaire can also find the "scent" of another soul, enabling her to lead Gyosei to the creature to whom it belongs, further adding to the griffin's perceived eeriness. In the spirit realm, Bansealgaire appears as a large, golden saber-toothed cat, accented with white and connected to Gyosei via long smoke-like threads of gold. *Griffins born in the Legere are not given an officially recognized name until they join a Pride. 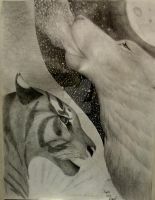 The names in a Pride will often follow a similar theme or stem from the same language (as is the case with Kasai's pride, all of the names are Japanese words or phrases). This is meant to create a tighter bond amongst a Pride, which ideally helps the group work and fight well together. 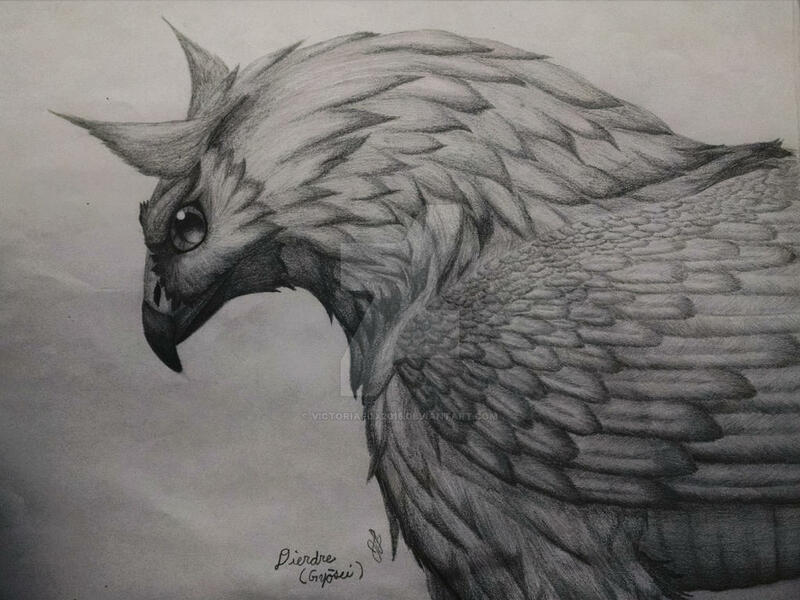 As Prides are often sent out to attempt to settle in new areas, preventing an overpopulation of griffins in any one place, it is essential that the unit have strong bonds. Griffins born outside the Legere are given a new name which they are expected to use, though some prefer to keep to their old name, a practice which is greatly frowned upon. Some, like Gyosei and Miso, will keep both names, giving their birth names only to those who they feel close to, while using their Pride names in day-to-day life. 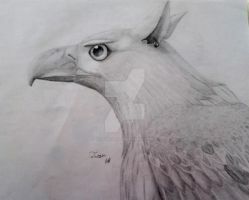 **Though there isn't a huge variation in the lion half of griffins, the bird half can be any bird of prey. It is this that defines many of the griffin's characteristics, both behavioral and physical. 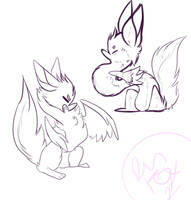 I tend to use the bird types as a guide for coloration and head shape as well as physique. These types are also indicative of the griffin in question's homeland or culture. Though the map I have designed for this world is much different than our own, the cultures and origins are based off of real-life peoples whose cultures, I try my best to accurately mimic in my griffins. ***The Soulstone is a physical home for the griffin's spirit upon his or her death (though there are a few rare cases of griffins using the stone before their demise, but it is a great mystery as to how or why this would occur). The stone will take on a shape based on the griffin's "ability" and can grant part or all of the griffin's "ability" to its bearer. The stone also provides the griffin with the opportunity for rebirth, though this can only be used once and the griffin can only take over the body of a creature with a soul matching its own and can only merge into an intact body. Because of this, rebirth is incredibly rare and can occur centuries or even millennia after the griffin's death. she looks wonderful! and she is so well fleshed out, my goodness, wow! well done! Ah she looks stunning and I’m so glad to see you finish her! Also, quick question: "cold bab"? So at initial meeting she would seem cold to most, and I tend to say bab for people’s characters or critters. That’s all the reasoning behind that lil phrase, sorry for any confusion. No worries! Was just curious, thanks! Thanks! She's been fun to work on, I look forward to doing the rest of the characters now. Can’t wait to see the others, and ah that’s a struggle I’m becoming familiar with as I’m making my own story. The characters being from a closed species along with a human for the ‘first gen’ and am roughing out a ‘second gen’ since I have enough species members to do so. Considering a comic style without them talking but I might add dialogue or at least thoughts in the description of each panel but that’s for another time. Definitely let me know when that story’s up! Have a great day and/or night and of course! Will do! You let me know if/when you do your story too! I love reading them!! You have a pleasant night/day as well!